ODEKA Ke Chocochik is a quest in Final Fantasy XV. It was added with the Moogle Chocobo carnival update. To complete it, you’ll have to find 15 Chocochicks in Altissia. They are scattered all around town, and they will start running away once you approach them. Once completed, you will receive 10 Choco-Mog Medallions, which can be used to purchase various items. 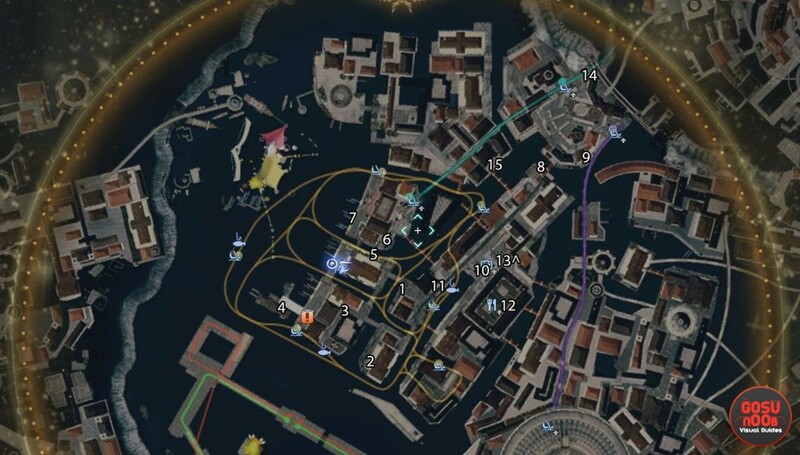 In this guide, we’re going to show you all Chocochick locations in FFXV and help you finish the ODEKA Ke Chocochik quest. Check out the map below, and a short description of each one. Use your point warp ability and the gondolas for much faster travel. In Odeka Ke Chocochick Carnival quest you’ll find out that Chocobo has lost his baby Chocochicks, and your task is to find them all. The first one is very easy to find. It is in the center of Altissia, near a flower cart and a small stairway that leads into the river. On the southern side of town, you will find an area with chairs and tables with yellow umbrellas. Head towards the other side of the table area and you will se two people hugging. The second chick is behind them, near the wall. Just a few steps behind the fishing spot on the south side of town. On the western side of town, you will see a gondola and a shop very close to each other. There is a dock in front of the shop, and a building filled with benches and flowers. You will find the hidden Chocochick on the left side of the dock, towards the edge. South of the quest giver, and north of the chocobo race. Head towards the building with the pillars and windows. A hidden Chocochick is next to a door. Head down stairs, just in front of the quest giver. You will find it just as you descend the first set of stairs. In front of the big moogle doll, just west of the quest giver. In the northern part of town, you will find a man dressed in a black chicken costume with a green shirt and hat. Just go behind him and take a right into a small hallway. Just south of the far northern gondola, there is a long walkway overlooking the canal. Between a fishing spot and a shop in the center of town, there is a small bridge with a Chocochick on it. There’s another one between a fishing spot and a gondola in the center. He is near a guy in a yellow Chocobo costume. Head left once you get inside the Square Enix Caffe. Once you exit the Sqaure Enix Caffe area, head right while keeping to the left side. In the far northern part of the map. Just head left once you exit the Listro Park gondola and go down the stairs. Just head across the long tunnel bridge with a dead end. It is located just a bit north of the Palsino street station. There are two Chocochicks that are very easy to miss, since they are very well hidden and pretty fast. They are marked on our map with numbers 4 and 15. Happy hunting! Nenad is an economics student who loves video games and plays everything except horror games. He is particularly fond of NBA 2K and first-person shooter games like Battlefield. If you do the quest a second time, you’ll get 30 medallions. On the third go around, the chick’s are invisible but they don’t seem to move. Not sure what the medallion count is for that as I’ve only found 3 so far. Wow, sorry for trying to help you all out. This helped out a ton! Thank you buddy!